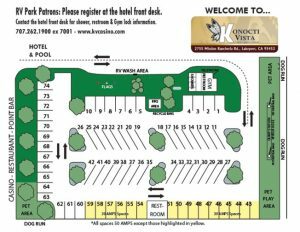 The Konocti Vista Casino RV Park is located just a few steps away from the casino, restaurant, marina and beautiful Clear Lake. 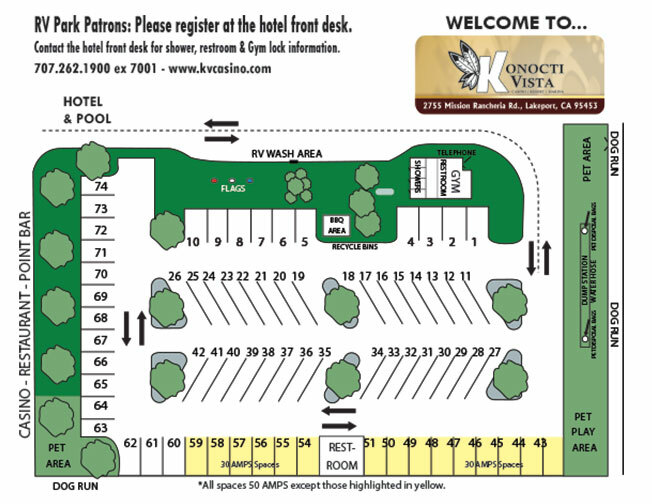 Just go to the hotel front desk to register for your RV space. (Scroll down to view rates and discounts). New Fitness Center in the RV Park Building. Includes NordicTrack stationary bike, and treadmill, stair stepper, weight machines, & pull up bars. The new Fitness Center is open to all RV Park and hotel guests. Key Card door for easy entry. Open 24 hours a day. 24 hour video security. Children under 12 must be accompanied by an adult. 74 spaces, hook-ups 50 & 30 amp service. CALL: 1-877-577-STAY (7829) FOR RESERVATIONS. Rates: $40 (Sun. – Thurs, per day), $45 (Fri, Sat & holidays, per day) plus tax. Weekly Rates available at $35 per day for seven consecutive days. All taxes additional. No refunds. Monthly Rates $35 per day up to 28 consecutive days. (If you stay 28 consecutive days, you are required to leave for 2 days before you can return for additional days). Discounts available on weekend and holidays with AAA, Good Sam and AARP 10% Off. Discounts Subject To Change. Management Reserves All Rights. Please note: Hwy 175 is NOT recommended for RV’s or vehicles with large trailers. It is a narrow, winding, mountain road with tight corners. Please consider alternative routes, Hwy 20 or 29.